Houston’s First Puppy Prom At Bark’s 5th Ave.
It’s prom season…so why not have a puppy prom? 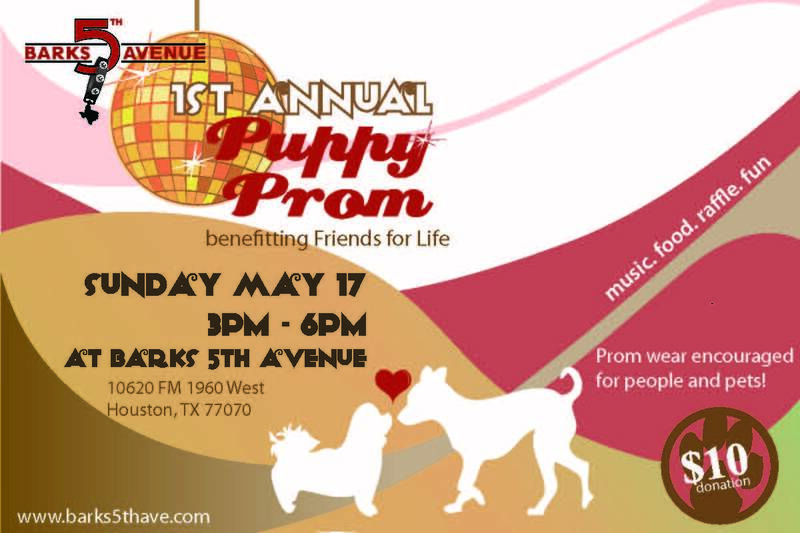 The folks at Bark’s 5th Avenue in northwest Houston are hosting their 1st Annual Puppy Prom as a fun little soiree benefiting Friends For Life animal rescue. For just a $10 donation, you can participate in this fun event with your pet…people and dogs are encouraged to “prom out”! The event will be held at Barks 5th Ave., May 17 from 3-6pm. Food, drinks, raffle and just a good time await you! For more info, visit Barks 5th Ave .